Many people today believe that these celestial signs are only starting to be fulfilled in our day, with such events like solar flares that occur in the sun and the 'blood moon(s)'. But the truth is, the Bible verses in Matthew and Luke where Jesus talks about celestial signs in the stars, sun and moon have already been fulfilled. Sure, there will be disturbances in the heavens as we near the very last days, but this particular prophecy of the sun, moon and stars in Matthew and Luke has already been fulfilled. And this is yet more evidence that we are living in the end times. Let's take a look at the Bible verses. Please read through this information, as there is an amazing connection between these signs and the "great tribulation" that occured during the dark ages which shows the validity of this information. So logic tells us that the celestial signs Jesus gave in Luke 21 would be the same as the celestial signs in Revelation 6 and Joel 2, because both are concerned with the end times. So have these signs in the sun, moon and stars been fulfilled? And what about the "great earthquake" in the sixth seal? Yes, these Biblical signs of the end times have been fulfilled as you will see below. Please Note: There is no confirmation in the above verses that these events would be worldwide and that the whole world would witness them. You will notice that the following "end time" events took place in the 18th and 19th century. So why are we in the year 2019 and Jesus still hasn't returned? Well, we need to remember that these Bible signs were not signs of Jesus' immediate return, but rather they were signs to announce the beginning of the last days. You could say that when these celestial signs happened, God began the final chapter of human history. And since then we have been getting closer and closer to the end of time. The signs as you can see from this site are getting stronger and we are sure to see Jesus return soon. So let's look at the fulfillment of these Biblical celestial signs. 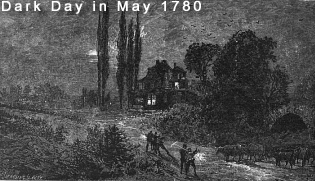 On May 19th in 1780 a dark day occured in New England in America. This dark day covered the New England states and parts of Canada. The darkness was observed as far north as Portland, Maine, and extended south to New Jersey. And the daytime darkness was so complete that candles were required from noontime that day until the middle of the next night. Now if you read the whole of the above bbc article, you will see man doing his best to try and 'explain away' this occurrence by attributing the dark day to a fire, and yet there is no record of any great fire at the same time. The 'scientists' of today desperately try to come up with any reason to explain away a prophesied event in a bid to keep people from accepting God's truth. Then on the night of this dark day, the moon was said to be blood red. 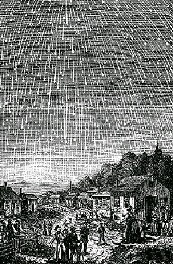 Since 1833 there have been more meteor showers, notably in 1966, 1998, 1999, 2001 and 2002. But none have come anywhere close to the 1833 event. Now some people I'm sure will say that these don't qualify as being the signs of the end times as described by Jesus because they only occured in America. Well, where did Jesus say that these celestial signs would happen all over the world? He didn't, therefore these events qualify as being the fulfillment of the celestial signs that Jesus prophesied. And don't forget about the "great earthquake"! What About the Great Earthquake? As you will see in Revelation 6 above, a great earthquake is to happen around the time of these celestial signs. Did we get one? Yes, on 1st November 1755 a "Megathrust" earthquake hit the city of Lisbon in Portugal, with an estimated magnitude of 9.0. Although it is commonly known as the Lisbon earthquake, it actually extended to the greater part of Europe, Africa, and America. It was felt in Greenland, in the West Indies, in the island of Madeira, in Norway and Sweden, Great Britain and Ireland. It pervaded an extent of not less than four million square miles. In Africa the shock was almost as severe as in Europe. A great part of Algiers was destroyed; and a short distance from Morocco, a village containing eight or ten thousand inhabitants was swallowed up. A vast wave swept over the coast of Spain and Africa, engulfing cities, and causing great destruction. The city of Lisbon itself was near totally destroyed. 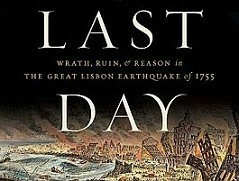 The great Lisbon earthquake is one of, if not THE most terrible earthquake ever recorded. And today, over 250 years later, geologists are still trying to piece together the tectonic story behind that powerful earthquake. Now there is something else that confirms these events above as being the signs that Jesus was talking about. In Matthew 24:29, as quoted at the top of this page, Jesus says that "IMMEDIATELY after the tribulation of those days" is when we would see the celestial signs in the sun, moon and stars. So what tribulation is Jesus talking about? He is talking about the tribulation that the saints suffered during the dark ages, when for 1260 years, the Roman Catholic Church persecuted and murdered tens of millions of Christians who would not bow down to her false teachings. This timeline spanned from 538 AD to 1798 AD. But the "tribulation" (persecution) for God's people came to an end around the 1770's. And when did the first celestial sign above happen? 1780! Immediately after the time of tribulation for God's people as Jesus stated. For more information about what the Roman Catholic Church did, including information on the 1260 years, see the THIS SITE. To find out what the Roman Catholic Church did during the tribulation, SEE THIS PAGE. So these celestial signs as prophesied in the Bible have certainly been fulfilled, showing that we are definately in the period of the time of the end. And when you look at all the other signs of the end times, there can be no doubt that our generation is living in the last days, soon to see the second coming of Jesus. Are you ready?